Otherwise known as the Vietnamese sub. This is one of those times that food network helped me find a new food to try. The show that clinched me having to try these subs featured a food truck named nomnom (you can already see why my curiosity was piqued.). Everyone flocked around this truck to get their unique sandwiches. I had to try it. So on our next visit out to Vancouver we hit vietsub, which many claim makes the best banh mi in Vancouver. I’m not a connoisseur yet but that was definitely one tasty sandwich. It was spicy, the pickled veggies had a delightful crunchy pungency that coupled blissfully with the creaminess of the dressing. Oh yes, I am a banh mi fan. I can’t go toddling off to Vancouver everytime I crave one though. 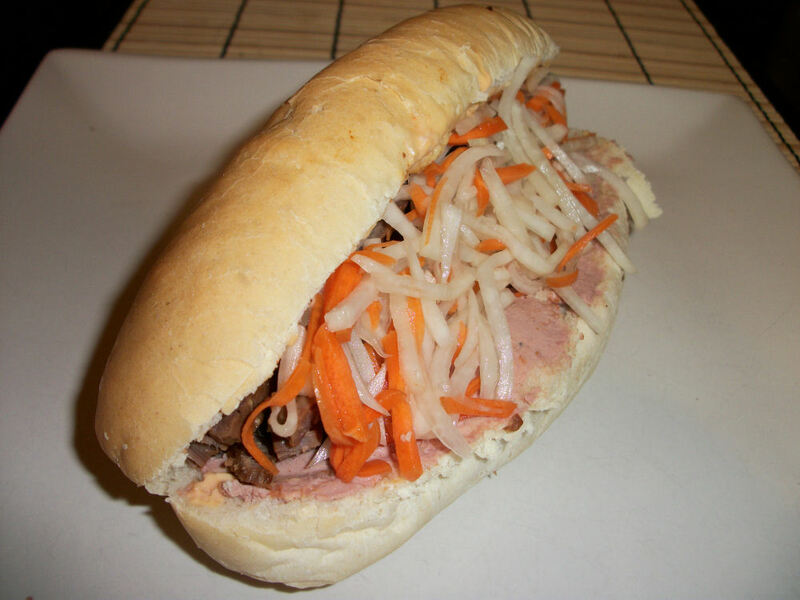 So, this is my attempt at my bon ami the banh mi. Combine the mayo and sriracha, cover and refrigerate. Combine the fish sauce, soy sauce, canola oil, 1 tbl sugar, garlic and pepper in a bowl. Add the flank steak. Cover, refrigerate and allow to marinate for atleast 4 hours. Combine the carrot, daikon, remaining sugar, salt, and rice wine vinegar in a bowl. Cover, refrigerate and allow to pickle for 4 hours. Turn once during this process. Drain. Heat a skillet to medium. Sear the steak for 2 minutes on each side. Set aside to rest for 5 minutes. Thinly slice across the grain. Cut open the rolls, spread the cut top side with half the spicy mayo mix and the bottom half with 1 tbl of liverwurst. Top with the beef and the pickle mixture. Repeat with the other bun. Serve. Serves two bon ami. Each serving (without bun) contains 216 calories, 10.8 grams fat, 1.4 grams fibre, 8.7 grams carbs, and 20.3 grams protein. Check out that protein! This is a great post workout treat. This entry was posted in Comfort Foods, Craving Buster, Dinner, Lunch and tagged Beef, Bread, carrot, daikon, fish sauce, Garlic, liverwurst, soy sauce, sriracha, vinegar. Bookmark the permalink. Love love love bahn mi. Interested by the addition of steak – most of the ones from the Vietnamese community around here are either pork or chicken (or fried egg – banh mi trung op la – so good!). I was told the more traditional ones were pork, I thought beef would make such a unique spin and you can’t beat how cheap a flash fry steak is for sandwich filling! I highly recommend. Just popping in to say this looks _delicious_. I’m a fan of pho but I’ve never had this before. Congrats on the new podcast! I can’t wait to give it a listen soon.